In this interview, Abigail Rutherford, director of vintage couture and accessories at Leslie Hindman Auctioneers in Chicago, talks about high-end vintage handbags by such designers as Hermès, Chanel, and Wilardy. Along the way she discusses Lucite and leather and clears up some misconceptions about the meaning of “couture.” She can be reached at lesliehindman.com. 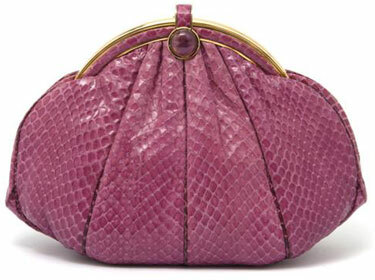 This round Judith Leiber pink snakeskin evening bag has gold hardware, a cabochon closure, and a hidden strap. Even as a young girl, I was interested in the historical aspect of handbags. I probably started collecting in high school when I became more aware of my own tastes. I went to a small art school for college and did a lot of studio work, even though I was an art history major. Eventually, I went to one of Leslie Hindman’s auctions and talked to her about the historical side of things versus the mass market of today’s fashion world. She took a chance and hired me as the director of vintage couture and accessories. That was more than three years ago. Handbags are like mini-sculptures—they are true works of art. In fact, I think fashion in general is an important art form that deserves a secondary collectors market. In terms of my own taste in bags, I love the Hermès Constance. It’s one of the more underrated Hermès bags, but I think it’s such a classic. I like some quirky stuff, too. Carlos Falchi is known for his use of snakeskin and lizard skin. I just buy what I like. I’m not going to buy something unless I enjoy looking at it in the same way I would a piece of art. Collectors Weekly: How long have people carried bags? Rutherford: Throughout history, people have always had some kind of bag or purse. I think men mostly wore them at first as a sort of carryall. It wasn’t until women began to gain independence and equal rights that high-end purses came along. By the 1920s, women were freer to do more things. I think the rise of the purse basically paralleled the history of women’s rights. Collectors Weekly: When was the word “couture” established in the fashion world? Rutherford: That goes back to the Chambre Syndicale in Paris, so it’s been around for more than a century. Couture really just means an article of clothing that was made for a specific client. The Chambre Syndicale audits the designer, who is then designated as a couturier. A certain number of very specifically skilled seamstresses have to be on hand for a designer to qualify as a couturier. It’s an expensive and dying art form. Couture and haute couture are used interchangeably. Our department is called vintage couture and accessories. We handle a lot of couture, but we also handle a lot of prêt-à-porter. In the ’60s, prêt-à-porter, which is French for ready to wear, was introduced and really became the mainstream. Couture is a very hot topic in the fashion world right now. Chanel puts on couture extravaganzas as a kind of advertising for its ready-to-wear lines. These shows set the tone for Chanel’s season, but they have a very limited couture clientele because no one’s going to spend $200,000 on a gown for one event anymore. Collectors Weekly: Is couture still associated with France? 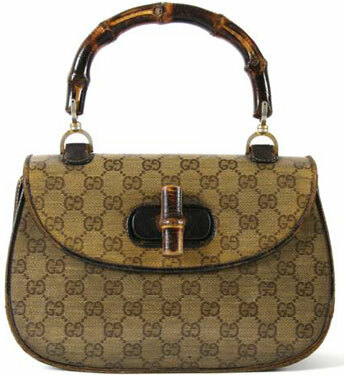 Gucci is famous for its bamboo-handled bags and logo print. This one, from the 1960s, is stamped Gucci. Private Collection, New York, New York. Rutherford: Yes, because that’s its birthplace. Chado Ralph Rucci is an American designer, but he also had to apply to the Chambre Syndicale before he could call himself a couturier. Lots of people call themselves couturiers, but I think there are only around 10 of them working today. It’s an intensive screening process. Certain designers are really committed to it, and there are a lot of Middle Eastern clients right now. There will always be people who’ll commission a wedding gown or debutante ball gown, but the overhead for the couture houses and their shows is incredibly expensive. So it’s seen more as marketing and advertising for the regular lines than an inducement to get people to actually hire Karl Lagerfeld to fit them for an unbelievable evening gown or suit. Collectors Weekly: Who are the major couturiers and couture houses? Rutherford: Historically, the biggest and best known couture houses have included Chanel, Valentino, Yves Saint Laurent, Christian Lacroix, Armani Privé, Elie Saab, Givenchy, and Christian Dior. Karl Lagerfeld has been at Chanel since the early ’80s. Valentino, who started in the 1960s, just retired, but he’s already had two new designers enter the fold. Hubert de Givenchy is no longer around and Christian Lacroix had to declare bankruptcy and was bought out. Collectors Weekly: Have handbags and purses always been considered part of couture fashion? Rutherford: Technically, couture only refers to clothing. Bags and things like that are in their own category. In fact, when we talk about older accessories, we only refer to them as vintage, not couture. Purses were very utilitarian at the turn of the century, but in the 1920s you started seeing some really intricate mesh and beadwork bags. Around then, purses started evolving from a simple pouch to a more complicated handbag. A lot of times, purses and handbags mirrored pop-culture trends. For example, in the ’20s, women who wore those slinky, shapeless flapper dresses carried similarly slinky mesh handbags. In the ’30s and ’40s, when women’s clothing featured more structural shoulders, we saw more structural handbags, too. 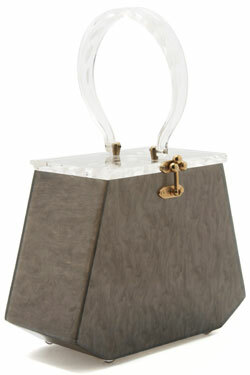 Lucite and Lucite handbags came along in the late ’50s early ’60s—it was part of the whole Mid-century Modern movement. You can look at furniture of that era and then at a Pierre Cardin dress, which is incredibly modern, and picture a Lucite handbag with it. In the ’60s, you saw a lot more structure to handbags because everything was very linear. In the ’70s, there were some slouchier handbags because there was a more bohemian current in the air, but the bags themselves still had a lot of structure. For example, an alligator bag is always going to have a structured shape because it’s made out of really tough skin. Then in the ’80s, everything went colorful and very pop. It was very ostentatious, with all the crystal purses and stuff like that. Collectors Weekly: Who were some of the couture designers who became known for their handbags? Rutherford: I’d say Chanel was number one. Chanel seems to be incredibly hot right now. We’re getting the best prices ever for Chanel. She revolutionized the handbag in the ’50s with the 2.55 bag, which takes its name from the month and year it was introduced. Chanel’s black-fabric quilted purses from the 1960s had goldtone straps, a back pocket, double flaps, and a crimson CC-logo lining. What set Chanel’s handbag apart was its shoulder strap. Every other bag prior to that only had a handle. Chanel’s had that long chain bag—the classic Chanel bag that you see pretty much everywhere. The strap was adjustable so you could carry it like a handbag or lengthen it to put over your shoulder. Of course, Chanel also revolutionized women’s clothing, too, because she introduced women to suits. Another innovative designer was Hermès. They started off as a saddlery company, producing a lot of equestrian equipment and trunks, but then Hermès pretty much revolutionized the handbag industry in the latter half of the 20th century. The Kelly bag that Grace Kelly wore, which she used to try to cover up her baby bump, is an iconic bag to this day. Hermès also brought out the Birkin bag, for Jane Birkin, and the Constance bag that Jackie Onassis often carried. Until recently, Hermès was just an accessories company but they’ve started producing clothing, although they’re not known as a couture house. Some of the older Gucci bags are pretty sought after if they are in really good condition. The Gucci bag is also associated with Jackie and is even known as the Jackie bag because she wore it all the time. Gucci began making purses in the ’60s. In addition to the Jackie bag, they were known for their bamboo handles—they did it once and it stuck. You see bamboo handles on Gucci bags to this day. Collectors Weekly: What other fashion houses that weren’t couture-caliber produced high-fashion purses? Rutherford: Well, in addition to Hermès and Gucci there was Louis Vuitton. The foundation of those three companies was their leather goods. Louis Vuitton started out as a trunk company. Like Hermès, I think they did some equestrian wear, too. Gucci made trunks and so did Goyard. Changes in modes of travel led them to switch to handbags and accessories because people no longer traveled with trunks—these companies also got into regular luggage. From there, they saw a huge area for growth. Luggage and bags are a big part of the fashion industry today, and it all started in the mid-20th century. Collectors Weekly: Were high-fashion purses designed at the same time as a dress or an outfit? Rutherford: There was usually an accessories designer employed by each house. Karl Lagerfeld, for example, has an accessories designer on staff. As the creative director of Chanel, he would, of course, be very involved in an accessory’s design, but there’s usually also a designated accessory designer. 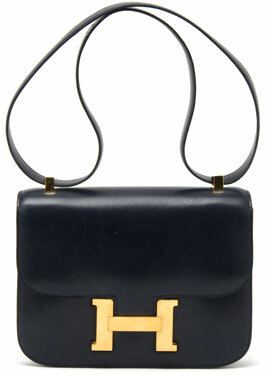 The Hermes Constance (this one is from 1976) was made of navy-blue leather with a matching shoulder strap, an open pocket at the back, and gold hardware. Whoever called the final shots, the best bags always seemed to be made of exotic skins. We see a lot of these types of bags come through our auction house because they’ve worn so beautifully over time. For example, bags made of baby crocodile, baby alligator, or ostrich—some of the very toughest skins—are a little more rare than ones made of cowhide or calfskin. There are all different types of leather—buffalo leather, calf leather, goatskin—and there’s a wide variety of hide types. Hermès hand-stitches everything, but machine stitching is used at a lot of other houses. As a result, the bags all have different strengths. Then there are bags made of Lucite, plastic, or cloth, as well as those adorned with beads or embroidered. Some designers use jersey, wool, or suede. Nowadays, there are some more avant-garde bags using interesting polyurethane-type mediums. It runs the gamut. Rutherford: They are interchangeable. Everyone on the East Coast calls it a pocketbook, and everyone in the Midwest calls it a handbag or a bag. It probably depends on what word your mom used when you were growing up. Collectors Weekly: What makes a regular purse an evening purse? Rutherford: They’re generally a lot smaller and usually very ornate. They’re like the Judith Leiber handbags: egg-shaped and crystal-encrusted. They’re very small, ornate, absolutely beautiful, and meant to go with a stunning evening gown. They can be your over-the-top statement piece. In the flapper era of the 1920s, women carried evening purses when they went out dancing. These purses were usually made of mesh or beaded. I’m sure they were expensive for their day. Whiting & Davis made a lot of them. Collectors Weekly: What sort of handbag did the typical woman carry in the ’50s, ’60s, and ’70s? This gray Lucite handbag with a carved floral handle and top is stamped “Florida Handbags.” From the estate of Norma Seidman, Lincolnwood, Illinois. Rutherford: A typical woman would be carrying some sort of basic handbag or shoulder bag. 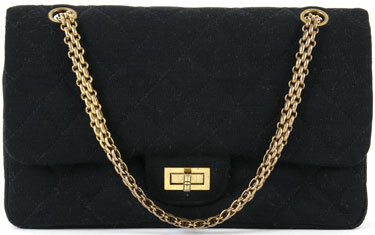 In the ’60s, women wore Hermès Kelly bags, Hermès Constance bags, or Chanel 2.55 bags. In the ’60s, if they carried a non-leather bag it was probably made of plastic rather than Lucite because Lucite was more expensive. In the ’70s and ’80s, leather was the rule. One popular style during the 1970s was the Yves Saint Laurent peasant-style bag, which was an outgrowth of the clothing collection he did in the ’60s and ’70s. In the ’80s, those Judith Leiber bags were very popular—presidents’ wives have typically carried Leibers to inaugural balls. During these decades, women had bags for everyday use as well as evening handbags and clutches. Today, the luxury market is much more available to the masses than it was even in the 1990s, much less the mid-20th century, so the choices are far greater. Collectors Weekly: You’ve mentioned Lucite several times. What exactly is Lucite? Rutherford: Lucite is just a stronger type of plastic. Plastic bags will yellow five years down the road, but not Lucite. The material was popularized in the ’50s and ’60s by a designer named Wilardy, who kind of made Lucite what it was. Florida Handbags was another big company for Lucite. Lucite bags are very modern in terms of their design. They’re like a box, they’re very linear, and they come in opaque, milky-type colors. Patricia of Miami was another designer who worked a lot in Lucite. You’ll often see etched designs on some of these purses. Collectors Weekly: Do you have a favorite handbag designer? Rutherford: I love Chanel. Their bags are timeless and classic. I really like Carlos Falchi, who’s a designer from the ’80s, and I really appreciate the craftsmanship of Hermès. It’s amazing how much Hermès accomplished just by hand sewing and the choice of incredible skins to create those bags. Collectors Weekly: If you are thinking of purchasing a vintage bag, how can you be sure it’s not a fake? Rutherford: Because it’s stamped. Vintage bags are stamped Chanel or Hermès, for example. We wouldn’t handle something that wasn’t stamped because we’d be concerned that it wasn’t authentic. Knockoffs and fakes have only really cropped up as a problem with bags made during the last 20 years, so they don’t affect us that much. We do handle some contemporary Hermès, so we have to be on the lookout for knockoffs. We always look for some proof of authenticity. Collectors Weekly: What sorts of purses do you accept for consignment? Rutherford: We seek consignments for specific pieces, not just any handbag of a particular vintage. People will contact me about a bag and I’ll tell them whether it’s right for our market. We’re always looking for Hermès, Chanel, Louis Vuitton, and Gucci. Those consistently garner the best price. But then there’s Lucille de Paris, who’s known for her incredible ’50s and ’60s crocodile and alligator purses. Whiting and Davis was a big name for purses in the 1920s. 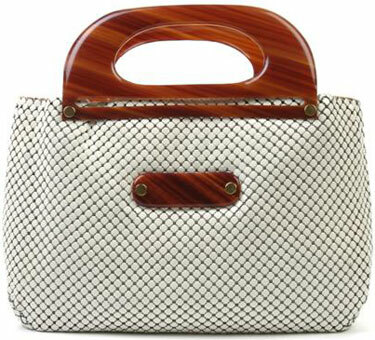 This white mesh number has tortoise resin handles and two interior pockets. We’re always looking for the three Lucite names I was mentioning—Wilardy, Florida Handbags, and Patricia of Miami. With handbags, we’re always looking for an array of bags by the designers who were synonymous with their decade, and we’re predominantly interested in the 20th century. We don’t really see anything older than that, but we would handle one if we got one. Certain museums are very interested in being able to represent a range of bags in their institutions. We get some pretty interesting stuff. 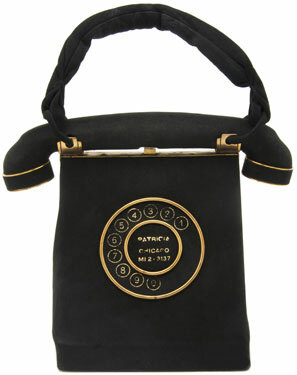 For example, in our last auction, we had a telephone bag. It was made in the shape of a telephone, had a dial on the front, the owner’s name (“Patricia of Chicago”), and a telephone number. Anne Marie of Paris, who was known for making handbags in the shapes of things like champagne bottles, made the bag in the 1960s. She was ahead of her time because we saw a lot of that sort of thing in the ’80s and ’90s. Collectors Weekly: When a designer came out with a line of handbags, how long would it typically stay on the market? Rutherford: There were new handbag styles offered every season. There’s been a new Hermès Kelly bag for the past 50 years every season. It’s the same with the Birkins since the ’80s, and with the Chanel 2.55 bag. They are classics, but the fashion houses and designers always give them a modern twist. Collectors Weekly: Do collectors tend to use their vintage purses? Rutherford: Some people wear them, and other put them straight into acid-free paper. Museums, obviously, give them safe havens, so it just depends. Collectors Weekly: How long have museums been collecting high-end purses? Rutherford: I think they’re actively seeking and buying them right now. A few have amassed some great collections just through donations. The Chicago History Museum is a prime example of that. It’s tied for second or third largest costume collection. All the ladies in Chicago donated their entire wardrobes to the museum, that’s why it has such great accessories. Collectors Weekly: Do you have any advice for someone fairly new to collecting high-end handbags? The dial on this ‘Telephone’ Bag from the 1960s features the name and phone number of its owner. Rutherford: Do a lot of research because you can easily get ripped off. A price guide is a great thing to have. It helps you understand the pricing as well as the market for handbags in general and what’s important and what’s not. Last autumn, Warman’s Field Guides published my book “Handbags.” It’s a price guide, and it’s small enough to carry with you. It gives a bit of history on some of the major houses. It also tells you things to look for, like how to identify exotic skins on 400 or 500 different bags. Another good book is Caroline Cox’s “Handbag: An Illustrated History.” Going to the vintage shows to see what people have also helps. And when you see something that’s really expensive, just ask why it’s priced so high. It sounds obvious, but a lot of people simply don’t do that—you can get some very important information that way. Thank you for such a fantastic article, I love to read anything about the history of fashion. I actually have an original 2.55 like the one pictured, and I hope to add to my collection in the future. You must have such a facinating job! Please tell me the value of the round Judith Leiber pink snakeskin evening bag has gold hardware, a cabochon closure, and a hidden strap. What year and any other accessories with it such as mirror or comb? Love Judith Lieber evening bags! I found a handbag stamped in silver “ROGER & GALLETT PARIS”. It looks like crocodile and has a silver long twisted rope strap and silver brooch on the front. I cannot find any info on this bag. I would love any info if you have any. how much did a louis vuitton bag cost back in the 60’s? i noticed Samantha had one on an episode of “Bewitched”. it was more of a satchel like purse. I am in possesion of a vintage navy leather Channel (stamped and in excellent condition) purse. I believe it is about 30-35 years old. I am interested in it’s value and history. I don’t know where to begin so any guidance would be much appreciated. I just recently acquired an excellent condition Patricia of Miami lucite bag as a gift. I knew nothing about Lucite or this designer until I decided to do a bit of research on the topic. It has the Patricia of Miami clear label on the inside under the hinge so I know it’s authentic. I’ve looked online and I cannot find any other Patricia bag like this one! Does anyone have any knowledge of where I could find a book or speak with someone on the rarity of this design? It is olive green, with black, red, and yellow threads, and gold sparkle specks. The lid is engraved with a flower design and the handles are clear. Can you tell me if there is a term to describe a handbag collector or someone who is addicted to handbags? Wonderful informative article. I love vintage purses and handbags, but do not have any known designer in my collection yet. However, I do have a style craft of Miami patent leather pocketbook which I love! condition and highly polished. Is this worth anything or do I give it to a charity!! Enjoyed this informative article. I have a root beer colored lucite purse that has a carved top that needs its two handles. Both are missing. Do you know where I can get this purse repaired? Hello, I have a very nice beaded vintage hand bag with the following making on inside: “Made in England” and a mark with initials R F C after it. The R is large and the F and C are smaller and underneath the R. I am trying to identify what this mark means or to authenticate it’s origin. I have a circa 50’s 60’s large porous, shiny scaled crocodile bag designed like a birkin bag. It has a gold brass knob that the crocodile straps cross over for closure. It has one handle at the top, with gold brass fittings. It is suede lined and has two slim snap/closure like compartments, (that might hold papers) and a zippered compartment at the back. It is beautifully made and in lovely condition considering its age. I bought it at an antique shop in Sardinia. But there is no name or markings in it. Can you please help me determine its provenance or value? I had the knob rebrassed and a couple of loose stitches on the handle repaired and each of the repair people commented on how exquisite the bag was. Thank you in advance for any information you may provide. Was Gucci leather bags ever stamped the word Gucci made in Italy into the leather? I have one that is aligator / and rawhide that is sewn together. Looks in excellant shape. Like new but it really couldn’t because it does not have the serial number that I can find. It’s just a beautiful bag. I have a bb Berger Bags (of New York) black leather box bag – am not sure what it is worth. The handle has a filagree metal piece in that shape and the corners have the same metal filagree. The square Gold Medallion on the front of the bag is beautiful about 3 3/4″ X 3″ and has an initial work round medallion fastened to it. The inside is light blue leather – Must be from the 50’s or 60’s. Have you had any of these bags? Thank you for your time. can anyone tell me who the maker was. “ ” Internet addiction was imagined as people consuming all this information in a very isolating way.